One of the most unique and addictive PC racing games has finally arrived on the Nintendo DS with TrackMania DS allowing players to race in an almost supersonic world of matchbox cars. Thanks to QVS Software Australia, we were allowed to play a sneak peek of this truly revolutionary game for the Nintendo DS. 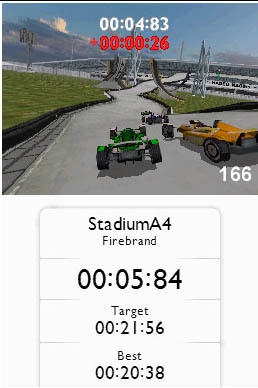 Drawing in positive aspects of the PC version and redefining them for the Nintendo DS, this current incarnation of the popular TrackMania series features all the thrills, speed and excitement all neatly located on this handheld console. The developers have also successfully brought across the speed of the title that compliments the 3D graphics perfectly and even those famous instant restarts from the PC. Sporting similar zones as the PC, TrackMania allows gamers to race on a variety of different gaming environments that include Desert, Stadium (my favourite due to its excessive nature) and Rally that all contain a variety of different tracks to keep you thoroughly entertained. The gaming environments are quite well detailed for the Nintendo DS and match that with dive different difficulty levels, there's plenty of varied gaming options for all people. What really sets the title apart from its competitors are the platform tracks that are reminiscent of Race & Destruction Derby as race through some wild tracks in order to beat your speeds. The title also contains a workable track creator that is quite easy to use on the Nintendo DS thanks for the Stylus. Feeling up for some multiplayer fun? Then TrackMania is also the game for you as you can play against three other friends (four players in total) or Hotseat (up to 8-players) as you attempt to beat your competitors. 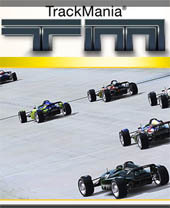 Graphically, TrackMania is probably one of the most visually impressive racing titles on the Nintendo DS with exceptional realistic gaming environments and some great attention to detail. 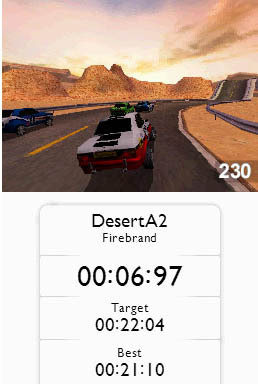 Best of all, the developers have maintained that sense of speed on this portable console that assists in immersing you into this challenging yet entertaining racer. Soundwise, the title is a little flat in the music department but the sounds of the cars and crashes are quite realistic and don't sound too "tinny" through the DS speakers. Of course, hook up a pair of headphones and this is how the game was meant to be heard. In conclusion, I cannot wait to see the final version of this game and from what we've see, the game can only get better and at the moment... it's only perfect!